As we prepare to enter the Six of Cups, let us take a few moments to cast our mind back to the Five. When we last visited the Cups, it was very upsetting indeed and we worried about how the black cloaked Figure was going to recover sufficiently to find their way back over the bridge into life again. The Figure had friends or family standing by waiting to help but it was too soon to let anyone get close. Perhaps the Figure didn’t want to be comforted, preferring to wallow in their sadness instead. When we left the Cups behind to explore the other Suits we weren’t quite sure how long the Figure would stand there staring at the fallen Cups in front of them. Would they ever acknowledge their friends or see the bridge in the distance? It is true that damage was done but the Figure needed to come round to accepting that life had changed and possibly irrevocably. For the purpose of describing this Card we shall refer to the Figure from the Five of Cups as a she or her but it can equally be a he or him if you prefer. Moving on to the Six, we are relieved to see that much light has come into the situation. It is obvious that the sad Figure eventually lifted her head, looked around and saw those who had stood by, waiting a long time. Reaching out to each other they embrace and tears fall all round. After much hugging and comforting, they take their first tentative steps towards the bridge, encouraging the fragile woman and assuring her that all will be well, for they are there to help. They will cross the bridge with her and any other ones they encounter along the way. Upon asking where she wants to go, she instantly replies “take me home. I want to go home”. Home, Homesickness, the Past, Past Influences, Nostalgia and Memories are key elements that accompany The Six of Cups. If you have ever watched the movie Gone with The Wind, you will be familiar with the heroine of it, Scarlet O’Hara, who was played by Vivien Leigh. Scarlet was a wilful young woman who was strong-minded and quite self-centred. She had an terrible habit of drawing drama to herself. At times it was funny but at other times she had to endure terrible trauma, starvation and want. At these times of despair, Scarlett would reach a terrible low (like the Figure in Card Five) and often flung herself to the ground, unable to cope with the burden she had been given. Each time we thought she would not get up again as she had nothing left to fight for, but somehow or other she always managed to drag herself to her feet. The camera would zoom in on her face so that we could see the look of delirium before it was quickly replaced by a sudden dawning of realisation or inspiration. She would then dramatically declare, “I know what I will do. I will go home. That’s it, home to Tara”. With no time to lose, she would have found herself a wagon or horse for the journey and be off. Tara was the large plantation family home she had grown up on and she loved every bit of it. Tara was where she got her strength from and it was to Tara she always ran when life got difficult or upsetting. Her parents, both gentle and loving, had infinite patience with her and put up with all the antics she got involved in. The staff and servants, although in despair of her at times for not acting lady-like enough, indulged her childish ways and selfish attitude. Tara was where she felt safe, loved, cared for and properly fed. It also was home to all her precious childhood memories. No matter how bad life was, she was bound to feel better once she returned to Tara. She was always Homesick for Tara. The Six of Cups nicely displays this scenario as we get a feel for the atmosphere contained within the Card. After times of loss, sadness or despair we often take comfort and solace from familiar places and those we have known the longest, such as old friends and family. We crave what is secure and steady as we have coped with enough change for the moment. In the Six of Cups, her friends or family members will happily take her home to ensure that she is well cared for and loved back to her natural warm self once more. Back in the bosom of her family and friends she won’t have to think of a thing, for everyone will be eager to smooth the way for her. They will protect her as much as they can, and if at all possible, shield her from further pain. The woman looks at her friends and realises how lucky she is to have been blessed with such good people in her life. They have known her throughout good and bad times. They have shared both tears of laughter and sobs of sorrow. Their very act of kindness begins to remove some of the chill from her heart and she is glad to accept all offers of help. In the Six of Cups, the woman’s loyal friends will stand by her and look for nothing in return. This is what friends are for and they know that she would do the same for them if the situation was reversed. They all have history between them or go back a long way. As the Figure returns to the Family Home to heal, she inhales the permanence of all she sees in front of her. She feels relieved to see that very little has changed. The road down to the house still looks the same and the local town makes her giggle as she recalls buying ice-cream and staring across at the boys coming out from the record store on the street corner. She screams “Oh my God, there’s Mrs Gordon, she can’t be still alive can she? as she sees a small rotund woman cross the road to the pharmacy. “Sure she was ancient when I was a little one. She must be at least 200 years old” . And there is Mr. Godfrey, the butcher, still writing up his daily specials on the old chalk sandwich board outside his shop. He looks at her and then looks again but does not nod or wave. She smiles to herself. She knows he has recognised her but just can’t put a name to the face. Laughing, she is hit by a sudden pang of strong nostalgia as she sees the old oak tree on the avenue where she used to hang out. Carved into the ancient gnarled bark, large as ever, are her initials intertwined by those of her first love, her childhood sweetheart, Joe. She racks her brain to think of when she last saw him and wonders what he ever did with his life; was he married, did he have kids, was he even still alive? As she pulls up outside her family home, she releases a deep breath and acknowledges that she should visit more often. Children play happily on the street and scurry round her as she takes her bags from the boot of the car. They ask her name and what she is doing. She chats with them for a while and watches them play. She can’t believe they still do skipping outside no 10. For a moment she is transported back in time and sees herself holding one end of the rope while her friend, Cathy, holds the other. Their little skipping song runs through her head and she is surprised to remember all the words. She suddenly feels a lump rise in her throat and her eyes fill with tears. Looking back, she thinks of how simple life was as a child, how innocent and carefree they all were. When did it all get so complicated? If only she could go back to being one of these children playing on the street, then she would not have to deal with difficult decisions or feel any pain except when she fell on the ground. Even back then, when she was upset, there was always mother or father to sort things out and make everything feel better. Now she craves that attention once more and is looking forward to being looked after in the coming weeks. As she stands beside the children, all grown up in comparison to their childishness, we see the yearning for those simple days of innocence symbolised in the two Figures in Card Six. In The Six of Cups, we see one Figure tenderly handing a Cup with a white Lily to a smaller Figure who wears White Gloves. The White Gloves are symbolic of innocence, fragility and protection. The smaller Figure looks up to the taller one with rapt attention and seems to be entranced with what he has to say. It looks like a very special moment is being shared. As they stand in their garden, they feel safe and protected. A Guard patrols the area and buildings which appear very close to each other ensuring that nothing of any danger will get in. The Guard and Walls also prevent the children from straying out of their safe environment into possible danger. The children look as if they have just raided a Dressing-Up Box as their clothes look unsuitable for their childish frames. They might be playing Make-Believe Games and pretending to be older than they actually are. The taller Figure does appear to be older than the smaller one but there is an air of acceptance and sharing between them. He is happy to give and she, happy to receive. The girl in our story stares at the children wishing to be one of them again while the children look up to her and wish they could be all grown up, just like her. The children wish to learn from her and they have much of value to offer her. There is mutual enjoyment in their observations even if they are a bit whimsical. Walking up the driveway, she runs her hand along the smooth paintwork of her father’s old Ford. Bits of rust are dotted here and there but otherwise it still looks the same. Even the old floral scatter cushions are still on the back seat. Nothing has changed. Inside the house, her parents have taken turns to watch out for her arrival and now they burst out the door eager to hug and embrace their daughter who is in need of their help. They had extended the invitation some time ago “you know you can always come home sweetheart, your room is still there and we would be so happy to have you”. However, in her early stages of sadness and pain she had just wanted to be alone and wait for everything to return to normal. When it didn’t, home she thought she would never get. Dragging her inside the house, her mother assured her that dinner was just ready and that her father would fetch her bags out of the car. In the Six of Cups the woman spends a wonderful period of time being cared for and looked after by her adoring parents. Meals are laid out on the table and her clothes washed, ironed and hung back in her room again. Nothing is asked of her, not even questions about all the trauma she had been through. They had told her to take her time, and only when she felt ready, then she could fill them in on all that went on. She was happy with that as pressure from any side was the last thing she wanted or needed. She just had to find her balance one more and feel peace of mind. She spent her days helping her father in the back garden. They planted White Lilies in Gold Pots and placed them on the patio. The back garden was bordered by an Old Tall Brick Wall and Houses (the background buildings). As a child, she had thought that the Wall towered high up into the sky, but now, it just seemed average height to her. It was funny she thought, how one’s perspective as a child can be so different. She and her friends had used that Wall in many of their games. At times it was a strong Fortress Wall to keep out the enemy and at other times, it was their Castle Wall as they danced around in princess dresses. Now, it was just a Wall and the neighbours houses behind seemed much closer than she remembered. Oh to have the wild imagination of a young child she mused. At other times, she went shopping with her mother or fetched groceries for Mrs. Armstrong, the elderly lady two doors down who could no longer get around. As a child, she had not spoken much to Mrs Armstrong and as a teenager and young adult had nothing at all in common with her. In fact she had never been in her house before but here she was, happily shopping for her, mowing her lawn and sipping tea with the old lady over a friendly chat. Who would have thought it? Her being Community Spirited and doing Kind Deeds for the neighbours! It made her feel good inside and was far more rewarding to think of others for a while and not just herself. Mrs. Armstrong was far more inquisitive than her parents and asked constantly about her situation. She probably didn’t have many callers so enjoyed the bit of companionship and gossip when she got it. The children on the street often asked her to come out and play. She was happy to oblige them. She showed them some of the games she played as a child, which of course she then had to join in on just to make sure they got it right. She had a great time but wished she had more of their energy. Life moved on nicely and as each day passed, she became stronger, healthier and more balanced in herself. She no longer constantly thought about her situation but just enjoyed the simple things in life. She watched television with her parents and got hooked on the old black and white movies they forced her to watch. She called in on old school friends who still lived in the neighbour hood, catching up and even babysitting for them on occasions. She was happy in herself, that is, until two things happened and it seemed to take off from there. Change was coming once more. Those hazy days of summer began to blow away. 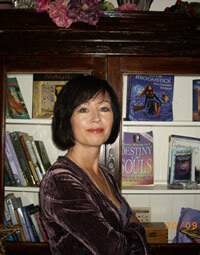 On one of her trips to the local store she encountered Joe, her childhood sweetheart, at the counter. She was surprised to see him as she had heard he now lived abroad. Joe wasn’t as shocked to see her for his parents had told him she was home. As they spoke her heart beat very fast and she felt awkward in her speech. She couldn’t wait to get away from him as she was not suitably dressed for such encounters. Her hair hadn’t been washed in two days and her clothes were soiled from working in the garden. Joe didn’t seem to notice and looked her over admiringly a few times. He told her he would be around for a while as his father was recovering from a stroke and he had come home to help with the business. When she went home that day, she made casual enquiries from her mother about Joe and found out that he had been married but that his wife had left him for her boss. He had two children but the ex-wife had custody of them. “Poor man” her mother sighed. “Apparently, he only gets to see them two or three times a year”. She also found out from her mother that he lived and worked in France but often travelled as part of his job. He was single as far as she knew. And so, her content calm state vanished. All she could do was think about Joe even though she hadn’t a clue why. She was not in the market for a man, certainly not after all she had been through. Imagine, after all these years, getting back with your childhood sweetheart. It was the stuff movies were made of but daft otherwise. However, she did spend an awful lot of time after that going up and down to the shops for the slightest thing. She had several encounters with Joe, at first just standing on the street talking, then it was coffee, then a drink and before they knew it, they were going out on dates. The second change came when her parents started to push about her plans for the future. They were eager to promote Joe to her and kept going on about how nice a man he was. Her mother occasionally read her texts if she left her phone lying around and often walked into the living room while they were having a kiss or cuddle. It also started to annoy her that no matter where she put things in her bedroom, her mother would come in and move them around. Things she hadn’t noticed before began to irritate her. Every time she went out with Joe they asked were they were going and what time they would be back at? Would she be having dinner with them or were they eating out? Sometimes they didn’t know where they were going, when they would be back or whether lunch or dinner was included but her parents, especially her mother, needed to know for some reason or other. She began to remember that the same thing annoyed her years ago and she used to say to her best friend back then that she couldn’t wait to move out. How had she forgotten? She began to feel the four walls close in around her. Everywhere she went, there they were, asking if she was okay and wanting to know what she was doing or planning to do. Even when she sought peace and quiet in the back garden it wouldn’t be long until her father appeared out from behind a bush needing help with the pruning or picking up leaves. They seemed to be everywhere and anywhere. She also felt she was being watched by the neighbours on the far side of the garden wall who she often found in deep chat with her mother. When she tried to lose a bit of weight by cutting down on some of the constant feeding that was going on, her mother took it as a personal insult and sulked. What had happened to change things so much she thought as she stood staring out the window at the children playing. The answer came quickly enough. For that blissfully unaware period of time she had worn those old Rose Tinted Glasses that she didn’t even realise she possessed. Her need for comfort and security had caused temporary amnesia or had strangely altered her recollection of the past. Now when she looked at her parents, the lines on their face became more pronounced. Her mother seemed stuck in habits and routines, cooking and cleaning for a family long gone. Her father more worryingly so, appeared not completely with-it at times. He was forgetful and she noticed he sometimes talked about things he needed to do in the garden that he had already done the day before. He also had a bad shake in his left hand and very rarely took the car out of the driveway anymore. He seemed tired and looked so small at times. Like Scarlet O’Hara, who arrives back at Tara after fighting her way through “those damn Yankees” she finds that everything has changed. Her mother is laid out in the front parlour after dying that day and her father’s mind is half-gone. He still thinks the mother is alive. Scarlet, who was used to running home every time there was a problem, now has to face the fact that Tara has changed. Her mother is dead and her father out of his mind. There is no food in the house or crops in the field. Scarlet, hungry, tired and drained realises that she can no longer rely on her parents to sort out her life because everyone now relies on her. She has to grow up rather fast. Why had she thought things hadn’t changed? Was it that she so desperately needed the comfort of familiarity when she herself had felt so unsteady and unsure. Change was the last thing she needed for so much had already changed in her life. She fooled herself into thinking that she could keep everything the same but she now realised she had no control over that. Change would always come and what she needed right now was some of the very thing she had tried to avoid, Change. One thing was for certain, she could no longer stay where she was. She had enjoyed her time at home, being looked after by her family and friends. Even the neighbours had helped, the kids on the road too, but now she had come to the stage where she felt cramped and restricted by her environment. Yes, it was just what the doctor had ordered at the time and she would heartily recommend it to anyone in her situation, but only for a short period of time. Life and the world outside, were carrying on without her. If she did not move her life on soon, she would begin to stagnate. She must now take responsibility for her own life and not lean on others so much. She felt safe and secure in the knowledge that she had good friends, wonderful family and a place she could always call home so it could not harm to dip her toe in ocean once more. She was truly blessed to have been given a second chance and could look positively to the future. Back in the Five, she had thought her life over but now in the Six, she realised it was only just begining. She felt ready to face the world again and take on a few new challenges in life. Ready to open her heart to forgiveness and move on, she felt healed and much stronger but also confused as to what exactly it was she wanted to do. Joe was heading back to France shortly and she should think about heading off too. She no longer had the heavy sadness looming over her so her head was free to properly explore her options. For the first time in a long time, she felt excited about her future. She was ready to find herself but first she must identify her needs, desires and feelings before taking off in just any old direction. She loved her parents very much but accepted that once she had left home all those years ago to make a life for herself there was never going to be a way to go back to those carefree days of childhood again. Yes, she would always visit and she could see they were getting older but for now they were fine and she would need to make her own way in life once more. As she watched her mother and father going about their chores, her heart almost burst with emotion. They were indeed getting older. They had done nothing wrong. They were doing what they always did and were happy to. She now saw them similar to children who needed to be minded and not the other way around. She would worry about them in the way they had worried about her but she knew that should the time come when they would need her, she would be home in a heart beat to tend and care for them, for that is what you do for the people you love. It is unconditional and does not come with strings attached. As for Joe and their future, only time would tell. If they were meant to be together then it would happen but for now she would not worry as she had a lot to plan for and some packing to do. On the day she left home again, her mother and father stood in the driveway, tears welling up in their eyes. She would be home again soon she assured them. She wouldn’t leave it so long again. Just as she was preparing to pull away from the kerb, her father put his hand up and asked her to wait. He had forgotten to give her something. He disappeared around the side of the house and into the back garden. He seemed to be gone forever but then reappeared. He had something in his hand. In through the window of the car he handed her one of the White Lilies they had planted in the gold flower pots (innocence, beauty, gift). “This one is for you my dear. Mind you look after it as well as I have looked after mine. Plenty of water and sunshine and they will be as right as rain”. She took the White Lily, holding his hand for a few seconds before letting it go. “What a lovely gift. Don’t worry, I will look after it well. You know, I did pick up a few things about gardening from watching you over the last few weeks. You are a good teacher” she replied and promised to ” treasure it forever”. As she drove out through the town, she noticed how tired and faded it all looked, but didn’t care, for this would always be home to her, her Tara, the place she loved, and one day, she would bring her own children here. She would proudly show them where she grew up and tell them all the wonderful stories of her childhood. Hopefully her parents would still be around to share them with and who knows, maybe they would plant some White Lily bulbs. If you like the story line above why not watch Gone With The Wind for yourself and see how you can apply the Six of Cups to aspects of the storyline. Another movie which focuses on the return to the homestead after upset and pain stars Sandra Bullock and is called Hope Floats (1998). Sandra plays the role of a woman Roberta (Birdiee) Pruitt who thinks she is happily married until she is publicly humiliated on a live show when it is revealed to her that her husband is having an affair with her best friend. Taking her daughter Bernice (Mae Whitman) and whatever she can pack into the car, she returns to her family home in Smithville, Texas and to her eccentric mother Ramona, played by Gena Rowlands and father Bill (Michael Parre) . Unlike Scarlet O’Hara who was constantly running home, Birdiee has a tough time readjusting and finds the town pretty much as she left it. However, there is a romantic tie-up with a childhood friend Justin, played by Harry Connick Jnr. It is a lovely story and nice to watch how her mother, regardless of Birdiee’s disinterest, does her best to mind her and bring her out of herself. Birdiee also has to face the fact that her mother is not getting any younger and has health problems. Her father is also struggling with Alzheimers Disease. Birdiee’s daughter has also to settle into her new environment and the transition is not easy for her either. Going home brings it blessings and curses into Birdiee’s life as she struggles with divorce and a child who wants her father back. At times, she feels she has stepped back in time and is a complete failure. She is very different to the woman who left home and Smithville many years before, but the town’s attitude to her has not altered over the years. 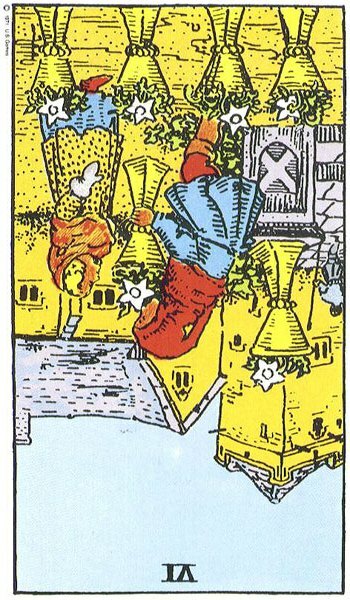 The walls of the Six of Cups and over-closeness of everyone drive Birdiee to distraction and near suffocation at times. Birdiee has many ups and downs to go through before she can find balance and stability in her life. She also has to come to terms with her past, her neighbours and make peace with her family so that she can build a future for her and her daughter. She eventually finds healing in the very last place she thought she would. Her story has a different outcome to mine above but it does have that warm wholesome feel of The Six of Cups even though it is not always a bed of roses. A real feel-good movie for sure. When the Six of Cups appears in a Spread, it often suggests that the past is being focussed upon or that the issues surrounding the Reading are being influenced by something in your past. By looking into your past, you may find the answer, solution or at least an explanation. Memories of the past flood in. For some reason or other, the past is significant in your life right now and you must ask why? It may be due to your current situation not bringing you the happiness you seek. If you were happy in the past, and it does not necessarily mean childhood, then you could be yearning for the old days or how things used to be. The Six of Cups can also act as a warning that you are living in or fixated with the past. If you are too rooted in the past it stops your forward progress and there is a danger of becoming shut down and very narrow-minded. Your memory of the past may be distorted, based more on fiction rather than fact. If you continue to live in the past, life will pass you by and leave you behind. If you have been through a tough time, then the Six of Cups can suggest that you are, or need to, seek support or solace from friends and family at this time. You may feel safer and more comfortable with familiar faces and places so it is not a good time for starting new things or heading off on your own. If you need to talk to someone about a problem then it should be someone who knows you well as he or she will better understand your situation and how it is affecting you. There are many you know who would gladly help. They may be standing by waiting for you to make the first move. Perhaps, an older member of the family who you look up to and respect? They may be only too willing to share some wise experience with you. The Six of Cups may signify a time when you return to the family home or locations from the past to heal and restore. Feeling nervous and insecure you may hunger after safety and security. You may feel the need, or crave, to be looked after and cared for by others. You may not feel capable of looking after yourself right now which is understandable if you are recovering from loss or trauma. After all the insecurity the sadness and loss the Five brought, one seeks a place of sanctuary. A need to be shielded from the pain of life in the outside world encourages the retreat into the guarded fortress. Nothing is going to get at you in here. You are safe, for the moment anyway. You need to heal and find emotional stability so accept any offers of help that come your way without feeling guilty or imposing. You must learn how to receive graciously and thankfully. All offers of help are genuine and sincere, so relax in the knowledge that you will do the same for them if ever the need arises. Don’t worry about being indebted to those who help at present for you will naturally find a way of returning the compliment. You may be surprised by the goodwill and kindness that is extended to you. Many around you are interested in your welfare and only want the best for you. 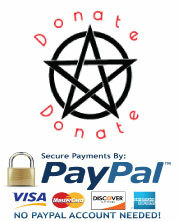 Expect spontaneous acts of charity, sharing and benevolence. Rest assured, peace and harmony will return to your life very shortly. Giving or Receiving a beautiful Gift may be represented by The Six of Cups. The Gift may be a present or surprise but it might also be an inherited Gift such as a talent or skill. There may also be the Gift of Forgiveness. You could be either the giver or recipient of this Healing Gift. You may inherit the family home, part of it or some valuable belongings or you could be making your will. As we see the taller Figure hand the Cup down to the Smaller one, it can symbolise that some one is entrusting into your care an item of great emotional worth and significance. You will need to care for it as they once did. There may be a Teacher willing to share their knowledge if you are interested. The Six of Cups brings a time for counting your blessings and enjoying the simple things in life. The Six of Cups Reversed, depending on surrounding Cards can suggest being left a wonderful gift by a parent. Being cared for and fussed over is wonderful, and at the moment, may be just what the doctor ordered, but eventually this very security and cossetting (castle walls, building and guard) will become claustrophobic and restricting. Staying under this influence should only be temporary otherwise there will be a risk to your personal development and growth. Return to life and personal responsibility as soon as you can. The Six of Cups is an extremely nostalgic card. It speaks about childhood and reminiscing about days of yore. Generally, The Upright Six brings happy memories and fond recollections of times gone by. The Six of Cups may simply represent a time when we take a trip down memory lane just for the sake of it. You may be sorting through old photographs, watching old movies or sharing memories with friends and family. Mostly, we rush around each day, caught up in what is happening now, what we have to do next and where we are going later. Very occasionally when the mood is right or a memory trigger presents itself, we are suddenly spun back in time and our mind unlocks the wonderful gems of our past. A significant song on the radio as we drive or the scent of freshly baked bread or scones can readily set us off. As the memories floods over us, we can re-experience and remember who we were, where we came from and the significant people or pets who shared our environment. There is however, a tendency to be selective with our memories. We all maintain that summers were better when we were children. The sun always seemed to be shining, we were always laughing and having fun out on the street with our friends and sweets were bigger and tastier. Ah, the Good Old Days! This can lead to you thinking about people not seen or heard of in years or even the desire to visit old haunts or previous locations. You may get great joy out of all your reminiscing but it may also leave you feeling melancholic and emotional for a past that cannot be retrieved. If you are middle-aged or older, then taking a trip down memory lane can be a little upsetting or destabilising. You may feel the loss of your youth, physical strength or health as a stark contrast to the fit and able-bodied young person you were many years ago. Nostalgia connected with old age is also represented in The Six of Cups as the long-term memory kicks in and short-term memory diminishes. Senility can be represented as the adult faces regress into childlike behaviour indicated by their size and dress. Nursing homes can be represented with this Six. The Six of Cups can indicate returning to the family home to look after an ageing or ill parent as the roles of parent and child reverse. You could also be taking them into your own home. You may find this emotionally rewarding and fulfilling but regardless of how much you love the parent involved, you are bound to feel trapped and claustrophobic at times. Then again, you may be taking a physical trip down memory lane as childhood places are revisited and childhood friends re-discovered. 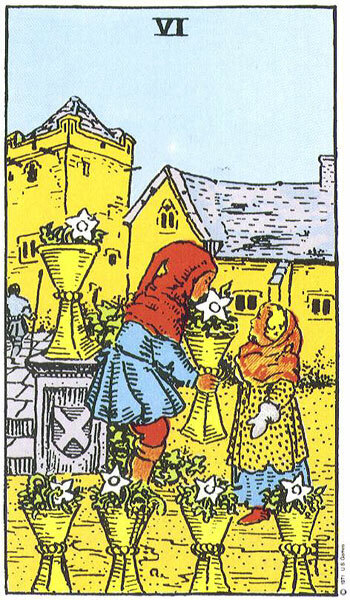 You may be attending a school reunion (look for the Three of Cups) or family gathering (Four of Wands). Funerals are one of the best times for meeting faces from the past and sharing memories. Older relatives, cousins, friends and neighbours often travel from the four corners of the globe to pay their respects. This in itself shows strong solidarity, caring, compassion and sympathy for the bereaved. However, it is one of those surreal times when the past and all the characters from it make a reappearance. Much sharing of tales and reminiscing can turn what could be a very sad time into a wonderful memorable occasion. You may learn some interesting things about people from your past at times like this. You may promise to keep in touch or wish to re-start old friendships and connections. It may just be “all talk” on the day or a genuine commitment. The Six of Cups brings the Family into strong focus. When we are growing from childhood into young adulthood, we seek freedom and wish to personally express ourselves by living our own life independent from parents, restrictions and other’s routines. We set about making this new life outside the confines of the family and may leave long gaps between trips home or indeed phone calls made. We can get so caught up in our present, and making big plans for our future, that there is precious little time for anything else except current friends and social scene. However, as we get older, once we have had a happy upbringing, we are often drawn back to the home and re-establish strong contact with parents and other family members. Rather than be embarrassed by our family, we realise that we are actually quite like them and have much in common. We no longer see them as the spoiler of fun or disciplinarian rule-setters but rather as human beings of great worth and value. Most of us gravitate back to the family as we get older especially when we have children of our own. It can therefore represent a time for feeling or re-connecting to your roots. If you live far away from family for work or relationship reasons, then the Six of Cups can suggest that you are terribly homesick. This may be only a passing phase or one that you find intolerable and depressing. They say that you should give any new location or environment six months at the very least before making any decisions as you need this time to settle in and readjust. If you haven’t tried before, then set up a Skype Account or one similar, but make sure to get everyone else on board too so that you can all keep in visual contact. It may help you through this difficult time. You may be realising the importance of your family for the first time. The Six of Cups readily represents children and the innocence of childhood. You may be thinking of having children or enjoy their company and playing with them. You may be looking after your grandchildren while their parents work or wish you could see more of them. You may be getting great joy being a parent second time round. You may be working on your inner-child and learning how to bring fun or play into your life. This card, because it relates so much to childhood, can suggest that childhood issues may be re-surfacing or coming back to haunt you. If you are experiencing problems in your life they may have originated in your childhood if the Six of Cups appears so it is a good place to start from. Life may be too harsh for you now and you may seek the comfort and support that the innocence of childhood brought. It may be a sign that you do not want to take responsibility for your self or situation. You may have a habit of letting others sort out your problems all the time instead of tackling them yourself. You may hanker after the loss of a mother or father and spend time revisiting childhood haunts trying to re-capture their essence. You may also be holding on to all their belongings, afraid to let go of the past. In a relationship reading, The Six of Cups can represent a relationship with someone from your past or an old sweetheart. If looking for love, then you may find it in your old home town or on a trip home. The love of your life may even be living next door or at the least not very far away. This Six in a Relationship Reading can also highlight a Past Love or Lover interfering or causing issues in your current relationship. They may turn up out of the blue and set you all aglow. You may not have severed the ties in an old romance or still hanker after an old love. There may be a third person in your relationship but their presence may be either an influence from the past or an actual reality (a real person). You may be comparing your current partner to an Old Flame you never got over. Absence makes the heart grow fonder and you may be viewing an old relationship with Rose Tinted Glasses. You may be very naive, innocent or idealistic when it comes to relationships or very gullible. You may also be looking for a ‘Father Figure’ so look out for The Emperor falling close by in a Reading. The Six of Cups can represent seeking your parents approval of your current partner or fiance. You may be travelling home to break the news of your engagement. Look to surrounding cards for further insight. The Six of Cups appearing in a Relationship Spread can suggest that you feel safe and secure with your partner. There is genuine tenderness, caring and a strong sense of protection. The relationship suggested may not be very exciting or dramatic but will be steady, stable and more than likely predictable. It is a relationship based on routines and habits. Generally one partner takes on the role of provider and carer while the other is happy to be looked after. Most important decisions are made by the carer who shields his or her partner from any unpleasant business or stressful situations. The carer may have the tendency to wrap their partner in cotton wool or treat them like a china doll. In the Upright Six, this arrangement is harmonious and works well. The Carer is happy to take on the bulk of responsibility and the Cared For, equally happy to relinquish it. Each brings their own worth and value to the relationship, which strikes a content balance. This Six often symbolises the ‘old fashioned’, ‘traditional’ style relationship. You may be longing for someone to look after you and take care of you or vice versa. The Six of Cups can also refer to a time of courtship or receiving a gift from the one you love. If you are in a stable relationship, you could possibly be thinking about having a family. If you have a child or children then you may be conscious of passing down the good morals and values you were reared with (the Lily in the Cup). The Six of Cups also deals with nursing and caring for a partner who is senile or very old. There is great love and tenderness between this couple who will be there for each other in ‘sickness and in health’. In a Career Reading, the Six of Cups often represents working with children as in Nursing or Montessori. There is a strong focus on protecting those who are young and innocent so a career as a social worker may be the right thing for you. You may also be dealing with people who had abusive childhoods, so a position that helped people overcome early trauma such as psychotherapy or hypno-analysis may be suitable and rewarding. You might also consider volunteering on help-lines or giving time to youth groups. You might be providing classes or workshops to those under guard such as in prisons or reform schools or facilitating group therapy for addicts or alcoholics. Any career involving making one feeling safe and secure can be suggested such as healing, meditation or massage. A career caring for the elderly or in a Nursing Home can also be represented by the Six of Cups. You may be taking time out from your career to nurse an elderly parent. The Six of Cups can sometimes highlight a career that is filled with habits, routines and patterns. There may be a motherly figure in the work environment who looks upon her staff as her children. Your interest in an old career may be re-ignited or you might decide to develop a childhood talent or skill. Beautifiying surroundings may also be of interest such as developing show gardens or doing up old properties. A secure comfortable position is often suggested by this Six but it may lack excitement or challenge. Depending on the surrounding Cards, this may be suitable at the moment but you are bound to get bored in the not too distant future. It can also suggest going for the long haul in a position or with a company as in joining young and leaving old. When The Six of Cups Reverses it can suggest that the focus of attention is now on the future instead of the past. The time for focusing on the past and old memories is over. It is now time to make some new memories. You may feel like you are coming out of a time of inertia and are beginning to take stock of your life and what is going on around you. Moving too fast from the past into the future can leave little time for the present. You must guard against ignoring this aspect as the saying goes “life is what happens when we are making plans for the future”. There is bound to be a transition period involved in moving forward. You may be coming out of a period of therapy or counselling and find that you are now ready to draw a line under your past and no longer let its influence affect your life. You may have had to do much inner-child work in order to release any ties or obligations you had to the past or certain people. You may feel reborn and an adult for the first time. You now have responsibility for your own life and with it comes a sense of freedom. You can now look back on past disturbances in an objective manner and view the issues from a new perspective. This work may have involved you having to say goodbye or letting go of a person or place. You may also have had to forgive another or yourself in order to let healing occur. You may be coming out of Rehab or have finally overcome alcoholism or drug addiction. You no longer need others to look after you as you must now stand on your own two feet. The thoughts of going it alone can be scary but you are ready. You are being trusted to fend for yourself and it is bound to feel liberating. The world takes on a whole new look and you can see the colour and magic of it all. You are ready to take your rightful place in it once more or for the first time. The Six of Cups Reversed often suggests that you are leaving behind a safe, secure and familiar situation for one that poses challenges, excitement and spontaneous opportunities. You had become bored and whereas nothing was wrong, nothing really had being happening in your life at all. The outside, new environments and even new people draw you away from your old life with the promise of adventure and happiness. If surrounding Cards confirm, then you are more than ready to take your leave. You probably have been for some time but were possibly nervous about taking such action. Pack your bags and prepare to leave but remember to close the door and gate behind you for others may not be at your stage just yet. If you have been cared for by others after a trauma or difficult period, The Six of Cups Reversed now brings a sense of boredom. Predictability and the presence of others and their routines begins to grate on the nerves. There may be a strong desire to free yourself if you feel sufficiently recovered. After the healing and need for security and comfort, the draw and pull of life lures you to wander outside the castle walls and see what others are doing. This is fine as long as all are in agreement with this but others may have got comfortable with the arrangement and are not in a hurry for it to change. The Six of Cups Reversed can simply suggest the end of a visit home. After all the homesickness of the Upright, you have taken a trip home but now must take your leave once more. This is bound to be very emotional for all. You may be given a few things to take back with you that will remind you of home. You might even be given a little money to buy yourself something nice. You are still a child in their eyes and need looking after. When the Six of Cups appears Reversed and you have been looking after an ageing or elderly person, then it suggests that it is coming to an end. Events will come about in due course releasing you from the need to be there all the time. Depending on surrounding Cards, a Nursing Home may be found, the caring shared or taken over by another or it may unfortunately be due to the death of the person involved. Regardless, things are changing and that part of your life is being released. You may feel sad or melancholic about not being able to hold on and no doubt you tried hard to keep things as routine and normal for the person as much as you could. You are now free to leave and should feel comforted by the knowledge that you have given of yourself, your time and your love. You have done your best because you are a kind-hearted and compassionate person. There is no need to feel any guilt. On the other hand, with it being a Reversed Card, you may feel resentful at having to give up your life to care for another. You may feel trapped and terribly claustrophobic. You may have lost contact with the normal world and friends as your life becomes filled with routine, medication time and hard physical work. Then again it may be you who is no longer able to look after yourself and need to ask a son or daughter for help. The role of parent and child reverse. You may feel this very upsetting and humiliating. A distorted recollection of the Past is common with the Six of Cups Reversed. If you have got rooted in your past or entertained an idealised version of it, the time is coming when you will have to accept that things may not have been as they seemed or the way you remember them. It can involve a reluctance to grow up or mature. You may be obsessed with a mother or father and find it difficult to cut the necessary ties in order to live independently. Stuck in an old-fashioned mode and fearful of change, you may stay close to home and spend too much time with your parents when you should be living your own life. You desire things to stay the same way and work hard to keep it that way. This can result in you getting old before your time and there will be a tendency to evolve into and become just like the parent you are close to. However, sooner or later you will have to let go or will be forced to. Letting go may come about with the death of the parent and the shock of suddenly being left on your own. You may try to keep things the way they were by hoarding their belongings, refusing to throw anything away and pretending as if nothing has happened. You must understand that you are no longer a child and it is time to grow up. The Six of Cups Reversed can highlight the passing down of something from one generation to the next but it may not be welcome or healthy. Depending on surrounding Cards, you may have inherited a genetic condition, depression alcoholism or unattractive qualities or traits. You may also be holding or guarding a family secret. Then again, you may be returning to the family home after a funeral to help clear and sort the contents. Going through such items will be highly emotional for you and will stir up so many memories of childhood, special occasions and times gone by. Make sure not to keep everything for yourself as there are others around who would like to have some of their belongings too. You may have bought a house that belonged to an elderly couple which is in need of modernisation. The couple who lived there have left their loving energy behind so it should be a happy place to live. The Six of Cups both Upright and Reversed comes with a pair of Rose Tinted Glasses for everyone in the audience. In the Upright we can wear them to reminisce about fond memories and how things used to be. We can remember people not as they really were but as a much nicer model. We can recall them as taller, slimmer, more beautiful, funny, kind, entertaining or adventurous. We can remember past lovers or partners in an idealistic manner, only calling to mind their more attractive qualities. We create a big pink shiny bubble and place them all inside. When the Six of Cups Reverses, it can go one way or the other and we may need to add extra Cards or look to the surrounding ones to determine what is going on. In the Reversed Six, we can wear our Rose Tinted Glasses all the time and not touch base with reality or the present at all or we can have them surgically removed or ripped off us. Without the bubble and Rose Tinted Glasses softening the edge of all our memories they can become tatty and faded or crude and harsh. We can then drop the pretence of our past and face the hard facts of who we are, were we came from and how we were formed. We may feel very disillusioned or disgusted. This may involve deep personal work as our distorted recollections may be covering up something shameful in our past. We may not want to face the truth or speak about things that happened during our childhood. If you have had an unhappy childhood this card indicates the time or need to deal with it. You must come to terms with it and leave it behind otherwise it will negatively affect your current or future life. Perhaps you are trying to leaving the shame of your childhood behind and actively seek a new beginning. There is a more sinister side to this card I’m afraid! On rare occasions this card can suggest childhood abuse that maybe denied or forgotten. The taller figure now takes the innocence of the smaller figure (symbolised by the white flower in the cup) that looks trustingly up to him… “Like happy family photos that hide a dysfunctional truth” (Mary K. Greer). Instead of protecting and keeping a safe environment for children, they are left exposed and vulnerable to hurt, abuse or injury. Reversed Pages, Reversed Queens or Kings along with several Sword Cards can indicate that something was wrong or dysfunctional during childhood but don’t go jumping to any conclusions. If you have made the time to take a trip down memory lane (literally), then you may be disappointed to discover that nothing is as you remember it and also that no one from the past remains. Your memory has possibly played tricks on you. This maybe a liberating or saddening experience for you. In a Relationship this card may point to a safe and secure relationship but is predictable and BORING. You may have idealised love and actively sought a partner to look after and care for you. This was probably what you needed at the time and made you happy. However, we all change and hopefully mature. The reality of a partner who is constantly watching and fretting over you, deciding for you and talking for you is soul-destroying. You feel restricted and have no room to grow or personally develop. You may have moved on from your relationship and now find that it is not what you want. You may decide to leave this safe relationship in search of something more exciting. If you have gone through a separation or divorce the appearance of the Six of Cups Reversed suggests that you are sufficiently recovered to get back out there. You have dealt with your loss and now feel ready to move on. Then again, depending on the surrounding Cards and attitude your obsession with an ex-partner who left you turns unhealthy. You need to accept that this relationship is over and he or she no longer loves you. Go back to the Five and release it. Do not deny the pain or sadness its loss brings but you must try to let go and move on. You will drag too much emotional baggage into the future with you and ruin your chances of ever finding happiness. You may meet a former childhood sweet heart you never got over only to find that they are not what you remembered them as. The Six of Cups Reversed can suggest you look outside your own area or normal haunts to find love. It also reminds us that love won’t come knocking on your door so you need to spread your wings a bit. In the Upright there were thoughts of having babies or starting a family but in the Reversed, you may decide not to. You may also be thinking of adoption or fostering. If you do have children, make sure they are happy with who you leave them with and also check play areas or gardens for it might not be as secure as you think. Then again, you may be too guarded and protective with your children. They need to be allowed some independence if they are ever to grow into responsible adults. A former lover or partner reappears and may cause problems in your relationship. A love triangle with someone from the past may take up where it left off. Childhood abuse may be tainting and destroying your current or even past relationships. You may be finding it hard to give or receive love. You may need some counselling or professional help. Shameful secrets kept for years may be resurfacing and causing terrible emotional unbalance. This can be a card of inner-child work but is also a time to grow up. You maybe redecorating or clearing out after the death of a partner. In relation to Career, the Six of Cups Reversed suggests a safe secure career that has now become stifling and boring. It represents a time when you leave a position, which is steady and predictable for a more challenging environment. Your current duties get neglected as the total focus is on the future. If you are involved in nursing or caring for the young, you may get too emotionally involved. You need to strike a happy balance. After working a lifetime in a certain position or company, the Six of Cups Reversed suggests that you are preparing to leave. Those left behind will miss you and are preparing to present you with a symbol of your worth. Accept all the praise, compliments and kind words. *Next time we meet the Cups in Card Seven we shall see if they have managed to say their goodbyes or are they still sitting pretty being looked after at home in the bosom of their family and friends. Are they bored yet with all the fussing over them? Have they started to think about what their future might hold or are they still steeped in the past and all that is lost? Do they want to move on and take a chance? What will they do next? What are they looking for? Does anyone have any clue what the meaning is with the 6 of cups reversed with the tower card upright? Well we shall have a look. I will do a quick post on these two cards together and then ask for some additional insights from the viewers. Without a question to go with it or other cards we will have to use our imagination, our intuition and also what we know of these two cards. Hopefully you will get something out of it. What does it mean if you’re a Sun Scorpio whose decan is Six of Cups?